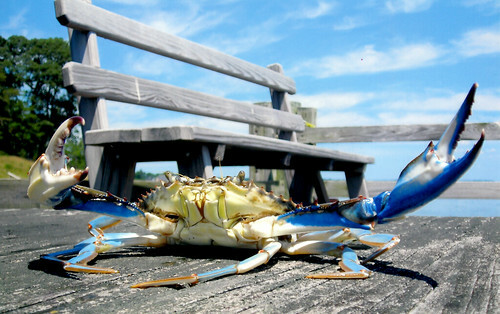 The recreational crabbing season in Maryland officially opens April 1 for the Chesapeake Bay and tidal tributaries as well as in the Atlantic Ocean, coastal bays and their tributaries. Recreational crabbing in Maryland can be done a variety of ways, with or without a license depending on the equipment and location. Licenses are required for anyone who uses a trotline, collapsible crab traps, net rings, seines or eel pots. A license is not required for anyone using handlines or dip nets. In addition, waterfront property owners, lessee, or tenant of a private shoreline property can register to crab license-free using up to two crab pots. A recreational crabbing license is not required in the Atlantic Ocean, coastal bays and their tributaries. Additionally, any passenger of a boat with a valid crabbing license doesn’t need an individual license to crab. To protect other aquatic species, all crab pots used by waterfront property owners in Maryland must be fitted with a bycatch reduction or turtle excluder device in every entry funnel. Pots must also be marked with the owner’s name and address or DNR identification number. All recreational crabbers are prohibited from selling crabs or possessing an egg-bearing (sponge) crab or any female hard or peeler crab. More information on crabbing licenses, restrictions, possession limits and size limits is available in the 2019 Maryland Guide to Fishing and Crabbing.